Get to know your pal! This is a weekly postcard series - US only. 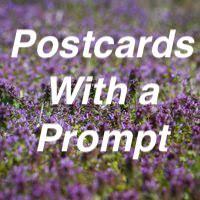 It's called Postcards With A Prompt and there's a different topic or question to write about on the back of a postcard each week. You can decorate the back or include a quote, lyrics, etc...as long as you address the weekly prompt. This week is Prompt #36: Share a favorite Springtime tradition for you and your family. Sign-ups will go through Saturday. Partners assigned on Sunday and cards mailed by the following Saturday. Thanks for rating promptly! Note you must be current on all of your swaps to participate each week. Postcards are sender's choice and should be store-bought (Zazzle or professional printing are OK). Check your partner's profile to avoid something that might offend. Be sure to include the swap name and number, and your Swap-bot user name. Cards should be sent naked and stamped (no envelope). This series is US-only. Feel free to host an international version, if you'd like. Open to all with a minimum 4.97 rating and no unresolved 1's or 3's. Newbies welcome with detailed profiles. I reserve the right to make exceptions and will angel if necessary.